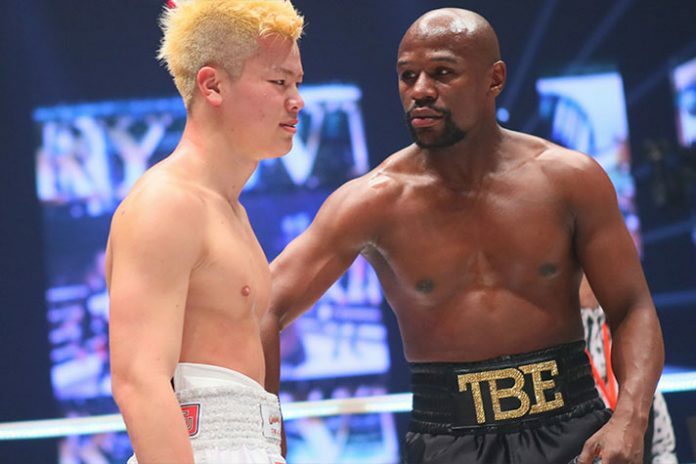 It took less than three minutes for Floyd Mayweather to knock down his Japanese kickboxer opponent Tenshin Nasukawa three times in a totally one-sided bout of exhibition boxing on New Year’s Eve. And believe it or not, Mayweather made cool USD 12.8 Million for his new year’s eve effort, almost USD 91,428 for every second of time spent in the ring against the Japanese. It was a quick and definitive victory for the 41-year-old American. Mayweather was gracious in victory, hugging the weeping Nasukawa and calling him “still a great champion”. Nasukawa, however, barely landed a clean punch against the vastly more experienced Mayweather. Mayweather declared his earnings for the night via social media. According to the American, who posted on Instagram indicating he was receiving $12.8 million. “What if I told you I was making $9,000,000 for 9 minutes of sparring in Tokyo Japan would you do the same if you were me?” Mayweather posed the question to his 22.4 million followers. “I like to call it a 9 minute walk thru #Tokyo #Japan”. “It’s all about having fun,” Mayweather told reporters after the fight, praising Nasukawa as a “young hungry lion”. The Mayweather-Nasukawa bout wrapped up an evening of more than a dozen fights.